Just like its corporate counterpart, the Kia Stinger, the G70 comes standard with a 2.0-liter turbo. All-wheel drive and a 6-speed manual are available but mutually exclusive. But the power play is with this car here; the G70 RWD with the 3.3-liter twin-turbo V6. It’s a powerhouse with an elegant interior and a chassis tuned for friskiness. 365 horsepower, 376 pound-feet of torque, an 8-speed auto and a 0-to-60mph time of 4.5 seconds only tells half of the story. This car is low, lightweight and lithesome. It’s what you would call dialed in but with the magic of drive modes it can also be an eco-minded small car replete with comfort and convenience. Gas mileage is rated at 21mpg on premium. What it doesn’t have is much room. Rear seats are pretty tight even with the deeply positioned bottoms and foot room can be non-existent. It’s also tricky getting in and out. 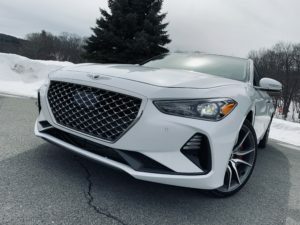 So the G70 is for you and your passenger to enjoy, much like going on a roller coaster with your friend, this car loves to spin its rear tires as you take it through the twists and turns. I have not watched or read one review of this car but I’ve seen the headlines: the G70 is not the Kia Stinger, 2 totally different cars. Well, that’s a bunch of crap. It’s OK but it’s completely misleading. Sure they are nuanced differences but this car drives very much like the Stinger GT I tested. Lots of turbo boost that comes on quickly that frequently overwhelms the rear tires for lots of tail wagging time. And for drivers who fancy themselves as decent or above that can be really fun. But if you’re not comfortable with how to steer when the back of the car is going sideways the G70 will scare the crap out of a novice driver. On winter tires and salt-covered roads, the G70 is overly eager to flaunt its stuff but a ball of fun if you like this sort of thing. Going back to the Stinger comparison for a moment, I do feel as though the G70’s handling is a little more predictable and not as prone to understeer then quick oversteer as I experienced in the Kia. The steering is beautifully light and accurate and whatever lack of feel I’m sensing I’m blaming on the winter rubber. The limited slip differential certainly gets its work in and even in the lesser drive modes, an abrupt push on the gas pedal will get the back end moving. Traction and stability control make sure things don’t get too out of hand and launch control also helps when going for max acceleration. This car is fast. It really shoves you into your seat as those rear tires desperately search for grip. The G70 definitely feels different than other cars in its class in that it puts the driver directly in the spotlight. Sport mode is the most rambunctious where the difference between simply cruising down the road and full on oversteer is a delicate push away. Is it fun? You bet. I’ve been really enjoying my backroad time and the cabin makes me feel right at home, but this twin turbo rear wheel drive G70 is for a specific kind of driver. The $4,250 Prestige Package adds these gorgeous soft Nappa leather seats with quilting, a heads-up display, surround view monitor and more. Other than having to squat some to get in, the front seats are very comfortable and the cabin is chock full of goodies like wireless device charging, all the driver assistance stuff, and brilliantly easy infotainment. And I love how when you activate Sport mode the driver’s seat side bolsters automatically hug a little harder. With the winter tires it’s a little noisier in here but not bad, the engine sounds can be adjusted up if desired and the ride quality is very well balanced…neither too firm or too soft with tight body control. I only wish the car started in Smart mode where the computer reads your driving style and tailors the G70 accordingly and not Comfort mode. The Hyundai electronics are excellent, though so getting to what you want is always easy. At $48,995 as-tested, I like this G70 but I’m curious about the all-wheel drive model just to see how the driving dynamics change. Paddle shifting in Sport mode on your favorite country roads is the reason you buy this one but if you’re looking for something a little meeker with more passenger room, you might want to keep moving.